I really liked the idea of choosing two technology tools to focus on this past week. I enjoyed learning about all of them but the idea of a Wordle and Voki really stood out. I was a little skeptical at first on how I was going to make these and what I would use as information in each one. Let’s just start off by saying the Wordle is AMAZING. I thought it was so neat that it arranged the words for you and you could change around the colors and shapes. I would definitely use this in my classroom as an introductory page to the lesson we were going to begin, perhaps by putting all the important/key words or vocabulary words on the sheet in a neat shape to get the students attention. That way they could always relate back to those sheets when they needed to think of the word. Creating the Voki was pretty fun. I had a sore throat this week and sounded kind of gross so I chose to just type in the information and then go from there. I chose to create a voki as if I was planning for my students to view it either the night before class or during computer lab time in class. It was a short sample of the beginning of instructions for a webquest to the Supreme Court website. I gave simple instructions on how to find the website and then gave two instructions for finding material on the website. I would definitely try to incorporate both of these ideas into my lesson plans and offer them as choices for the students to do projects with too! Information on Wordle: I chose a civics lesson from the state standard CE.3 (Social Studies, Grade7) from the Library of Congress website. This lesson focused on the values of American citizens. 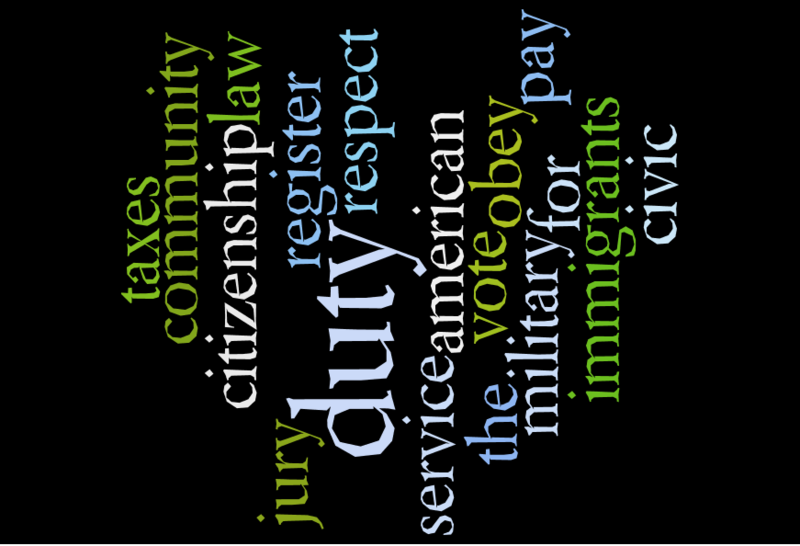 I decided to enter random words about America and civic duties to make into the wordle. I did not choose too many words in order to keep it pretty neat and clean. I think it came out nicely. I would want to play around with it more and add more words to it in order for it to mean a little more to the students and the lesson.